Arrows Sent Forth: Keeping it all together. 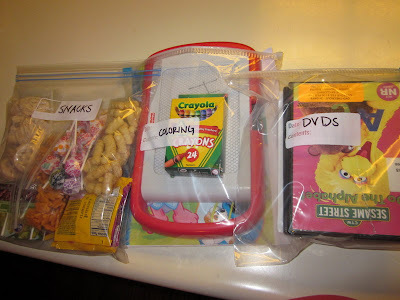 A few weeks ago over at the Delicious Baby blog, Debbie posted 22 reasons why Ziploc bags make great travel companions. While I'm nowhere near the prolific traveler Debbie is, I put Ziplocs to good use on our recent flight to Phoenix. I knew I wanted to pack snacks, small toys, coloring supplies, DVDs, books, and diapering/medical supplies for the flight. I also knew I only wanted to deal with one carry-on bag. I feared all these items would become a jumbled mess in my big backpack and that I would be frantically searching for a particular item while the arrow cried or whined. So I turned to the trusty Ziploc bag (the large, freezer ones) to help keep everything sorted and organized. It worked like a charm. It was also a huge help in getting us re-organized for the trip home. As you can see in the photo above, I labeled each bag and so I knew when we had re-gathered everything we needed for the return flight, despite having spread most of the items around the hotel room during our stay. In addition, it helped my husband (who was usually the "gopher" of whatever item we needed in-flight) to find things more easily even though he wasn't the one who packed the bag. You can read more about my tips for flying with a toddler here.